I have written a few times about "my" vine, an untended mass of leaves and untrammelled tendrils, which somehow yields copious vintages. Last autumn I picked enough to not only give several pounds away, but also experiment with making two types of grape liqueur! Just a few yards from my window, the vine is part of a communal garden, but had mostly escaped the attention of the two gardeners who come at various times... until last winter, when they clearly decided that it was in need of some radical pruning. I'm by no means an expert in viticulture, but I've seen vines after pruning, and there's usually more of them left than on this vine. This poor tree had been chopped back drastically, removing virtually all of it from the trellis it had been covering. The end result looked less like a pruning and more like a purging! All the newer, greener shoots were removed, and all that remained were the old trunk, desiccated branches - more like dry sticks than anything else - and a few gnarled old tendrils. How long would it be, I wondered, before the vine managed to restore itself and put forth new wood? 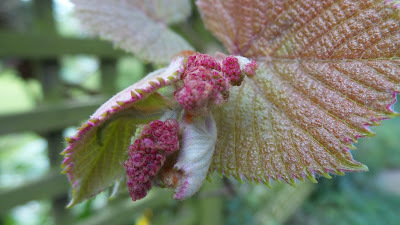 Would this year be a fallow year for grapes? And the boughs thereof sprout. Yes indeed, this dry old wood hath hope! 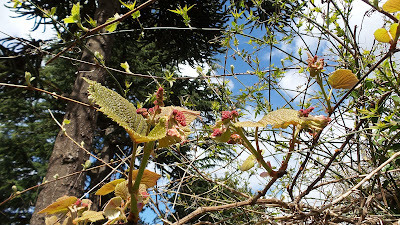 And then yesterday, when I went to take photos, I found the loveliest surprise! Each of those tiny leaf buds, now unfurling and stretching in the intermittent sunshine, contains the tiny seeds which will, over summer, gradually grow and develop into grapes. Wood hath hope! - lots of it, held in tiny pink seeds, smaller than grape pips - but each one filled with the hope and the promise of growth, and ripe, delightful sweetness. 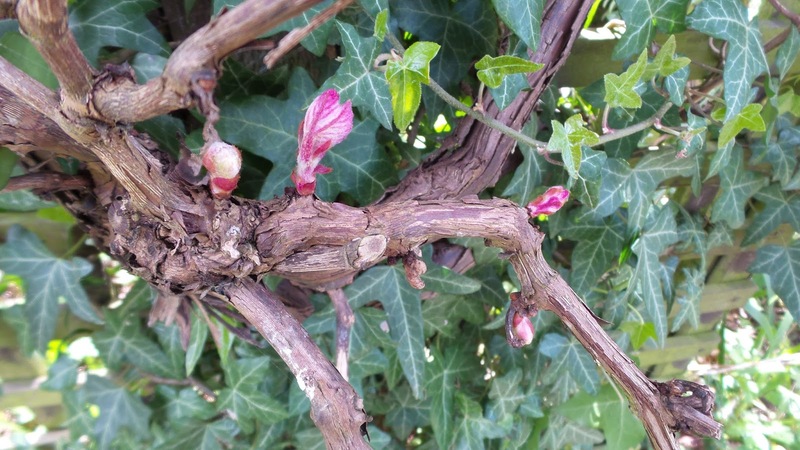 I had wondered if and when the vine could restore itself, could somehow acquire new life and a semblance of its former glory; could somehow grow green again, sprout boughs again... and now I had my answer - an emphatic yes. On Good Friday, in a world filled with bombing and violence and instability we pondered Jesus' ultimate gift of himself on the wood of the cross. And today, Easter Sunday, in a world still filled with bombing and violence and instability we celebrate the hope and promise of Jesus' Resurrection. Today we know for sure that the wood of the cross has hope; that it has in fact been transformed into the source of all our hope, and our joy. Today we marvel at the seeds and the promise of new life, and at the reminders, large and small, that death is not the end, because love has triumphed, and will always prevail. And, as Pope Francis encouraged us in last year's Easter Vigil homily, we now become joyful servants of hope... As joyful servants of hope, we must announce the Risen One by our lives and by our love. Have a joy-filled, grace-filled Easter, and may we all be joyful servants of hope - whether abundant or in tiny seeds - announcing the Risen One by our lives and our love.